Johann Joachim Winckelmann was a man who knew a thing or two about history and was not averse to the odd bit of adventure. A leading authority on Greek and Roman archaeology and art, Winckelmann's work was hugely influential in the field of art history, bringing new theories and insights to the fore in his writings and discoveries. Today marks the anniversary of the death of this great thinker but the method of his passing was for from distinguished. Instead, it was tragic, violent and senseless and came at the height of Winckelmann's fame. It came as he was travelling across Europe, returning from an audience with Maria Theresa of Austria, where he had been richly decorated. Winckelmann arrived in Trieste on 1st June 1768 and took up residence under an assumed name in a local inn as he waited to sail for Rome. Here he became acquainted with the occupant of the neighbouring room, Francesco Arcangeli, a 31 year old unemployed cook and petty criminal. 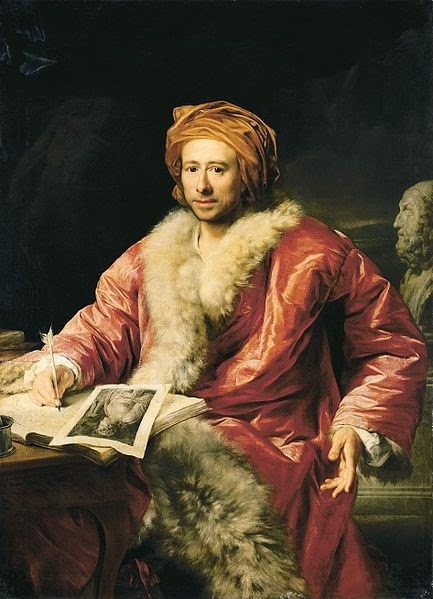 The exact nature of the relationship has been debated and discussed ever since Winckelmann's death with many scholars suggesting that the two men were lovers for the duration of Winckelmann's stay in Trieste. Certainly he and Arcangeli spent many long hours together and dined alone each night; Arcangeli was by all accounts fascinated by the historian, who shared with him tales of his adventures and illustrious friends. On 7th June Arcangeli launched a frenzied and ultimately unexplained attack on Winckelmann, initially attempting to strangle him with a length of rope and then, when this failed, stabbing his victim multiple times. Eventually he fled, leaving the fatally injured Winckelmann to seek help to treat the wounds that would soon kill him. In fact Winckelmann lived on for just a few short hours and though he forgave Arcangeli before he died, that was not enough to save the life of his murderer. Arcangeli was swiftly arrested and interrogated several time over the following days. He gave a number of reasons for the attack ranging from robbery to political intrigue but the verdict came quickly enough and Arcangeli was sentenced to death. The condemned man was executed on the wheel in front of the inn where he had killed Winckelmann, the true motive for the crime forever unknown.